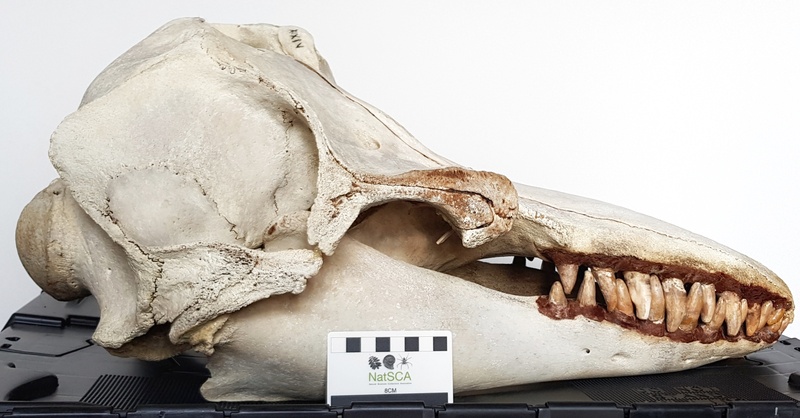 The reason for picking these was because I had an enquiry challenging the label associated with a specimen that was on display, and on checking there had clearly been some kind of mix-up, because the first mystery object had been identified as a False Killer Whale Pseudorca crassidens Owen, 1846 – which was definitely wrong. 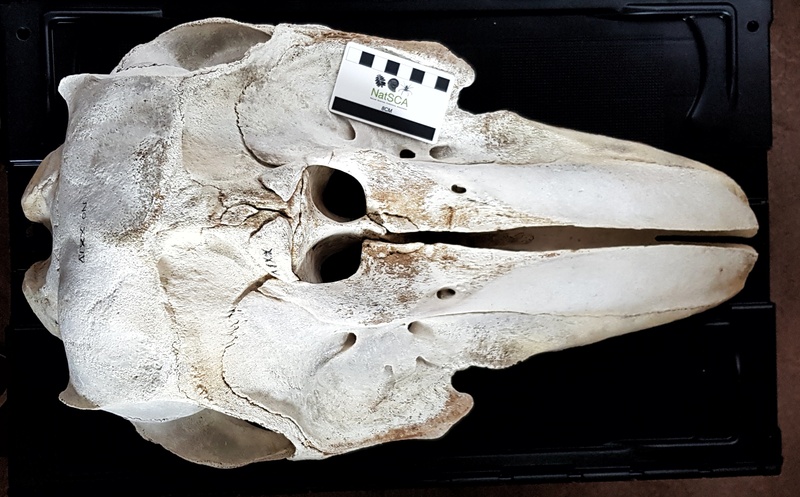 The second mystery specimen is in fact the False Killer Whale (an identification that palfreyman1414 got right, supported by Rémi), whose label had been mixed up. That left the first mystery object still to be solved. Obviously it’s a toothed whale of some sort and the scale suggests it’s not a porpoise (a bit big) and it’s clearly too small to be one of the bigger dolphins (like a Killer Whale or Pilot Whale). 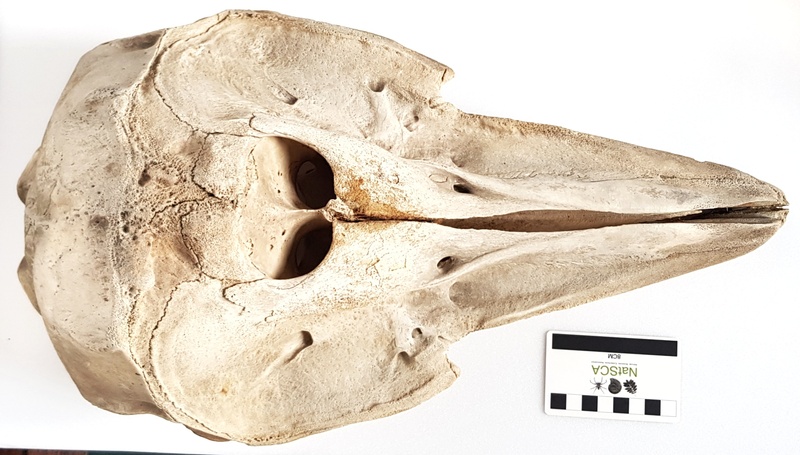 Generally it takes a bit of time looking at dolphin skulls from a few angles before you can start to get your eye in for identification – they just look so weird compared to the skulls of other mammals. They can also photograph quite poorly due to the large size – by which I mean that the height, length and breadth of a specimen can be distorted considerably in an image depending on small changes in the angle it sits at and the distance between the camera and the specimen. However, the things I always try to look out for are the shape of the rostrum (or snout), the slope of the forehead, the patterns made by sutures between the bones around the nares (nostrils) and sutures between the bones in the ‘cheek’ area. 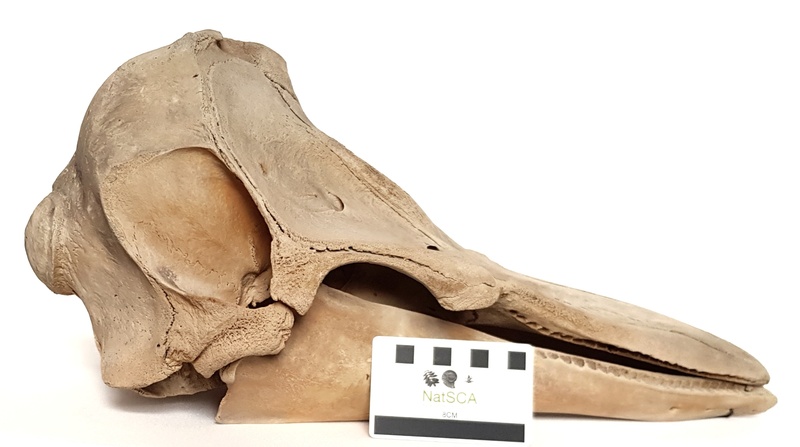 In this case there’s a very steep forehead, with a small bump midway, an upward deflection of the posterior maxillary margin (it looks like it’s got a bit of a smirk) and the sutures around the nares and the general shape of the nares all adds up to make me think that this is a White-beaked Dolphin Lagenorhynchus albirostris (Gray, 1846). Imagine how pleased I was when I discovered that there was a label with that name on it, hiding in a different case and missing a specimen! Thanks, Paolo – I always learn wonderful subtleties in anatomy from your revelations. Ta, Paolo. A great little mystery it was. Glad it was, at least, a short-nosed/billed dolphin, as we guessed. Sorry we couldn’t push closer on the specific identification.